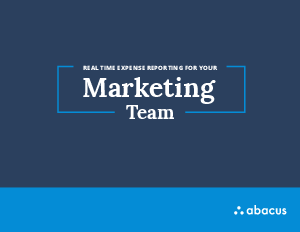 Abacus is a real time expense reporting solution that processes individual expenses as they flow into the system. No expense report required. It provides finance teams unprecedented visibility into spend and minimizes the work required to submit expenses. At one time, the most efficient way to get expense documentation from employees to the finance team was to tape receipts together and fill out templated forms. Today we have mobile cameras, automated accounting software, and convenient apps for peer-to-peer payments. We live in a world of real time data. You should be able to submit your expenses as easily as you pay a friend for your half of dinner!